An honour roll commemorates those who served in World War One. It lists 264 names. Three polished Harcourt granite panels for the Dimboola Memorial Elementary School are in the course of preparation by Mr. A. Massey, monumental mason of Horsham. 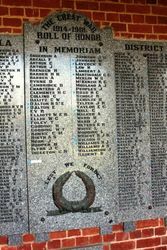 The panels, which stand 6 feet 6 inches high, will contain the names of 55 of Dimboola's young men who made the supreme sacrifice in the centre panel; whilst on either side, will be two other panels containing 208 names of those who were safely returned to their native land. When completed, the work will be fitted in the walls of the school as a lasting memorial to brave and gallant gentlemen. Horsham Times (Vic), 2 November 1923.